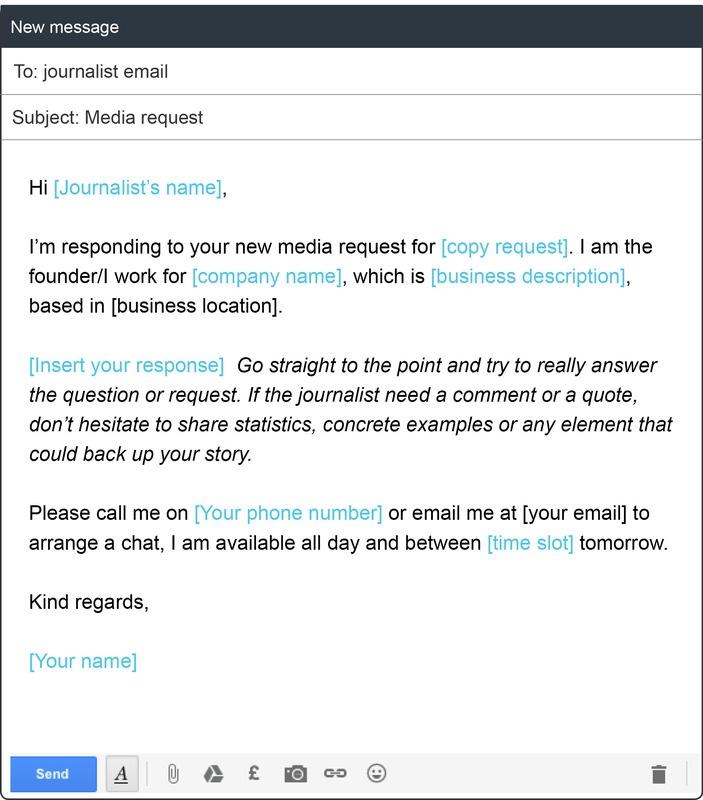 blog Business Tips Why respond to a journalists media request? Why respond to a journalists media request? We get many businesses asking us why they should be responding to media requests. What are the benefits? And why will it help their PR efforts? This is due to the fact that, when people think of PR, they often think only about writing press releases. Many people, marketers included, even think that PR stands for ‘press release’ when it actually stands for ‘public relations’. Now, although press releases are a big part of PR, it’s not the be-all and end-all. Business owners who are short on time and PR experience may struggle to think of newsworthy ideas, pitch to journalists or even write a press release. However, if they still wish to gain PR exposure media, requests are the perfect tool to help them on their way. Media requests are the one time a journalist actually wants to hear from you, making it the perfect time to contact them. From searching #journorequest on Twitter to sign up a media request service, media requests offer PR opportunities on a plate. Below we’ve listed 4 reasons why to respond to a journalists media request. Many business owners put PR at the bottom of the list because they don’t have time. However, responding to a media request only requires a few minutes. The response doesn’t need to be more than a few sentences and definitely not a long as an average press release. All you need to include is a sentence or two about your business and what it does. Followed by a short paragraph about why you’re relevant to the request. Finished off with your contact information and when you’re available. One of the key tips when responding to a request is to keep it short and sweet, meaning it will take you no time at all. In addition, there are companies, including JournoLink, who send media requests directly to your inbox. This means you don’t have to waste time searching for relevant requests on Twitter. You can receive the email, check if it’s relevant and respond almost instantly, taking no time away from the running of the business. The phrase ‘newsworthy’ is thrown around a lot when it comes to PR. Journalists are looking for ‘newsworthy’ stories, a story that people want to read about at that particular moment in time. Now, while almost all businesses have a news angle or business updates they can share, it can be hard as a business owner to pick out the right story and pitch it at the right time. Yet, when it comes to media requests the story is already there, meaning you only have to decide whether it’s relevant to you and your business. Not only is this, again, saving you time but also takes the pressure of finding the perfect story off when thinking of your PR efforts. Furthermore, media requests give you examples of what is newsworthy. For example, if you see editorial requests asking for comments on the latest Autumn Statement then you know this is a story journalists want to talk about. Therefore, when the Spring Budget or next Autumn Statement comes around you can be more prepared with you PR, meaning that over time you’ll be able to recognise what is newsworthy and apply this to your PR plan. Pitching to a journalist who you’ve had no prior engagement with can often lead to the journalist missing or ignoring the email. In comparison, when you’ve previously spoken to a journalist and they’re aware of your business, your pitch is more likely to be picked up. By responding to a media request you’re helping the journalists find what they need. And whether or not your comment is used, it’s still an initial engagement to start a relationship with that journalist. Meaning that they know who you are and can consider you for future articles or features. Additionally, this makes it easier to pitch to the journalist in the future as you can reference your previous interaction. For example, you can begin the email with ‘Thank you for featuring my business in your article regarding... ‘ or ‘I’ve previously spoken to you regarding your media request for…’. This will jog the journalist's memory which means they’re more likely to keep reading. Media request services and #journorequest on Twitter are used by a range of journalists working at various publications, from the BBC to regional newspapers and glossy magazines to trade media. Therefore, you could gain coverage in publications you hadn’t previously considered because you thought they were too big, small or you simply haven’t heard of them before. Yet, they may have the perfect target audience for your business. It is also important to note media requests are not only used by journalists but also by bloggers, influencers and content creators, who are equally as important to contact when considering your businesses PR plan and reaching your target audience. It's also a good way to get backlinks for your SEO. All of the above show why media requests are crucial to a business's PR plan and also how they can help business owners when first stepping into the PR world. If you would like to find out more about media requests and how to respond read our blogs ‘How to make an ‘irrelevant’ media request relevant to your business’ and ‘4 mistakes you made when replying to a media request’.